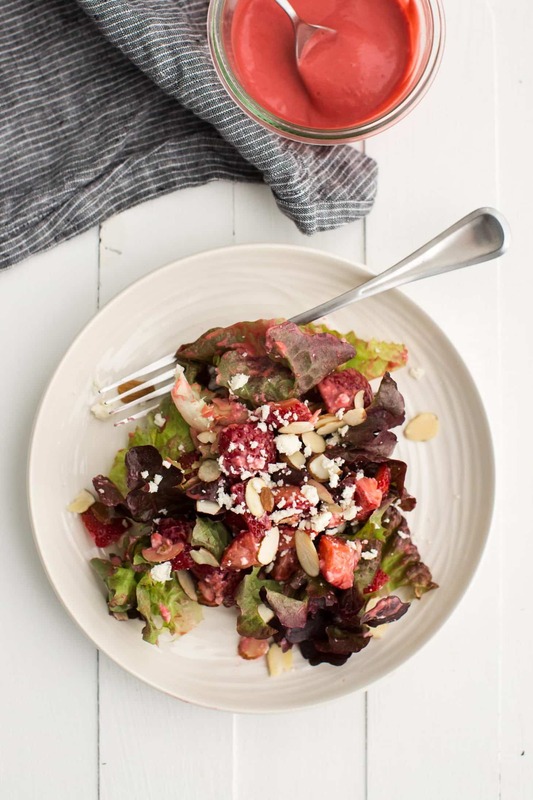 Strawberry Salad with Raspberry Vinaigrette | Naturally. Post sponsored by Cascadian Farm. See below for more details. In a world where there’s artificial coloring in so many of the prepackaged foods, it’s easy to forget that nature provides an array of beautiful natural coloring. 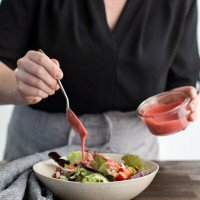 If you go to a restaurant and order a salad with raspberry vinaigrette, most likely what you will get is a dressing with more ingredients than need be with a few drops of coloring for good measure. It doesn’t need it. 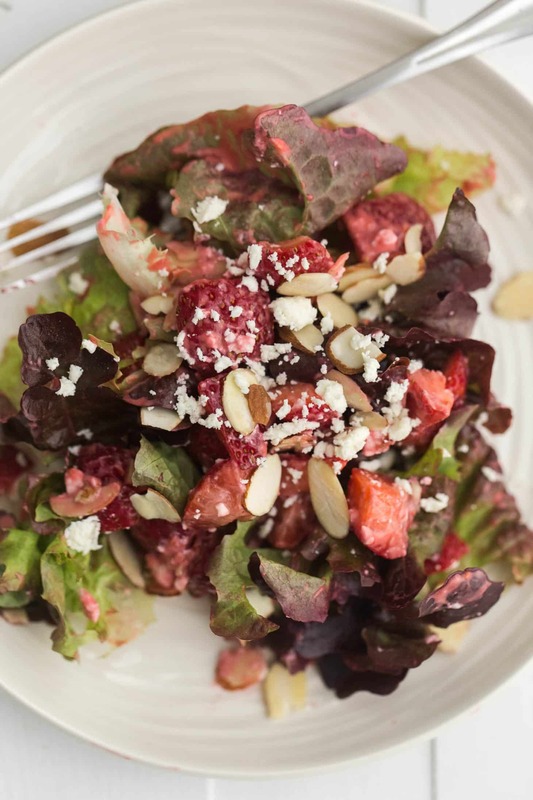 This strawberry salad showcases the beauty that is a homemade raspberry vinaigrette. It’s pink and delicious, perfect for pairing with other berry salads. 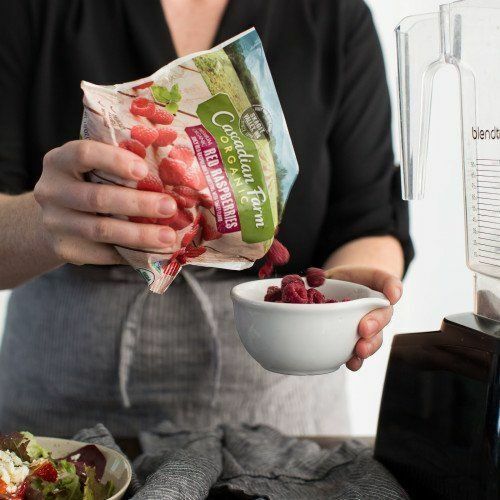 In a blender, combine ingredients for the dressing. Let sit for 10 minutes so that raspberries can thaw slightly. Puree until smooth then taste and adjust honey/salt levels if desired. 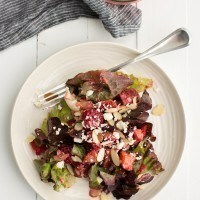 In a large bowl, combine the lettuce with the strawberries, feta, and almonds. Drizzle a couple tablespoons of the dressing over the salad and toss until well combined. Save leftover dressing for use on more salads. 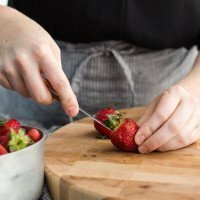 One of the things I love about this salad is the ability to highlight a seasonal fruit (strawberries) while using a separate fruit to pair. You could easily do this throughout the year depending on which fruit flavors you were looking to highlight. Fruit: Depending on the season, swap out the strawberries for other fruit like blueberries, blackberries, or even apples. 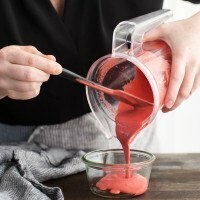 Dressing: While I love the raspberry base, any type of berry will work. 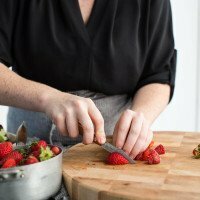 Try a blackberry or strawberry dressing (or a mix of all of them!) I prefer frozen fruit for the dressing because as it thaws, it provides more juice and breaks down easier when pureeing. Greens: I recommend keeping the greens simple- use a type of butter lettuce or baby spinach. Something that will work well with the flavors of the fruit. That looks amazing and is definitely going on my lost for next week! Thank you! I love having a salad for lunch. This looks really delicious. I will be making this in the next few days.